Come home at the end of the day to your spacious living room. Delight in daily continental breakfasts with fresh tropical fruit. Let yourself sink into the embrace of a hanging chair or lounger. Aqua Oasis is located near some of the best shopping in Waikiki, in the heart of all of the action. Get your day off to the right start with free continental breakfast. Have everyone get changed into their swimsuits, grab the sunblock and make a pit stop at the Koi and Turtle pond on the way to the outdoor pool. Hop in for a refreshing dip, or lounge poolside while the kids show off their cannonball skills. There’s also a cleansing sauna. When it’s time for lunch, grab a bite to eat at Kimukatsu Waikiki located on the first floor and serving delicious Japanese comfort food. 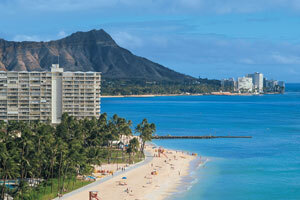 Or pack a picnic and head to Waikiki Beach, just a short walk from the resort. Work on your sun-kissed look or help the kids build the ultimate sandcastle. After a fun day at the beach, head back to the resort and get in touch with your inner-American Idol at the on-site karaoke bar. Spacious one-bedroom condos are air-conditioned, sleep up to five guests and make a perfect home base for your Waikiki vacation. Kitchenettes with full-size refrigerators and microwaves allow you to prepare the essentials (remember that on vacation DiGiorno Pizza counts as an essential). Don’t forget popsicles and Ben & Jerry’s for dessert, which you can enjoy while you watch this week’s episode of This is Us on your flat screen TV with cable. Don’t worry if the kids end up covered in ice cream; the resort has an on-site laundry facility. At the end of the night, gather the family on the private furnished lanai and watch the sunset. Up for a day of shopping? Take advantage of the resort’s free shuttle to Ala Moana Shopping Center. First stop: The Coffee Bean & Tea Leaf for an Iced Blended or mocha and surprise the kids with a “Pure” Ice Blended (made without coffee). Did you forget to pack your iPhone charger? No problem! There’s an Apple Store. Let the little ones go wild in Toys R Us and the Disney Store. Pick up your next poolside read at Barnes & Noble. Challenge the kids to a game at Lucky Strike Bowling. Check out the apparel at the Gap, Lululemon, and Express. Department stores include Bloomingdales, Neiman Marcus, and Nordstrom. If high-end shopping is more your thing, there’s Versace, Prada, Chanel, and Burberry. Hungry? Dine at Morton’s Steakhouse, California Pizza Kitchen, or Bubba Gump’s Shrimp Co. Take a family field trip to the Honolulu Zoo. Check out the lions, cheetahs, zebras, and alligators. Endangered species at the zoo include Komodo dragons, African wild dogs, palm cockatoo, and Asian elephants. Kids stay free! Up to 3 children under 17 years old stay free when using existing bedding.